La Wis Wis Guard Station cabin was built in 1937, and is an important piece of Gifford-Pinchot National Forest history. It is one of only two structures of its design in the region. The cabin is situated in beautiful La Wis Wis Campground just off US Highway 12, in the Cascade Mountains near the southern entrance to Mount Rainier National Park. Old-growth cedar and Douglas fir tower overhead, and the Ohanapecosh River and Clear Fork of the Cowlitz River create an idyllic setting. Three separate Wilderness areas are also in the immediate vicinity. The building is listed on the National Register of Historic Places (NRHP), and constructed as a Civilian Conservation Corps (CCC) works project. 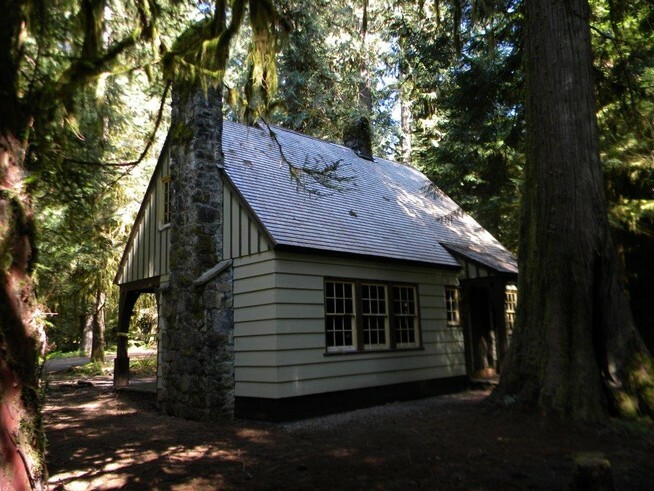 The 25’x32’ guard station embodies the distinctive characteristics of the Northwest “Rustic” style, typical of Forest Service, Depression-era architecture. This style design incorporates horizontal cedar siding, a tall gable roof with board-and-batten gable ends, exterior stone chimney, and distinctive multi-light windows. The cabin was used as an administrative residence until it went into disuse in the 1990s. Since then, it has been subject to water damage and moisture problems. The La Wis Wis Guard Station PIT project began in 2012 as the first part of a multi-year restoration and rehabilitation effort to prepare the cabin for future use. That year, project team members undertook a variety of activities including the replacement of roofing material, repair of the interior flooring, and repair of foundation components. In 2013, we removed the damaged original, knotty pine, tongue-and-groove wall paneling to prep for rehab, removed the old wiring and plumbing, and repaired the flooring. In 2014 and 2015, the knotty pine wall paneling was stripped of non-original paint and refinished. The paneling was then re-installed in the guard station and we undertook further interior work, including plumbing and electrical. Continuing in 2016, we reproduced in-kind trim and moldings, installed wall paneling, and did window rehabilitation and bathroom prep for the 2017 project. This year, our project will continue restoration and rehabilitation and will be divided, once again, into two sessions. During Session 1, we will focus on interior features: repair and rehabilitation of the kitchen countertop and hanging cabinets, repair of existing doors and reproduction of in-kind door casings and doors according to the Secretary of the Interior’s Guidelines for Restoration and Rehabilitation. All restoration work will occur off-site inside the shop and warehouse at the nearby Randle Work Center, whose buildings were also constructed by the CCC, and are likewise listed on the NRHP. The week will also involve a field trip to La Wis Wis Guard Station. During Session 2, all work will be done on-site at La Wis Wis Guard Station. This phase of the project will include further installation of interior wall paneling and ceiling panels, and we will install the doors, thresholds, and associated hardware completed during Session 1. If time allows, we also plan to install the fireplace mantle and bathroom fixtures, including the shower, toilet and vanity sink. We certainly have our work cut out for us in the on-going effort to preserve this unique and rare historical property! The project and its participants have added to the storied local history of La Wis Wis Guard Station and we will continue this tradition and dedication in 2017 – we hope you will join us in the effort to put this incredible historic resource back into use!